This time I am bringing you my new Tiki Room Set! 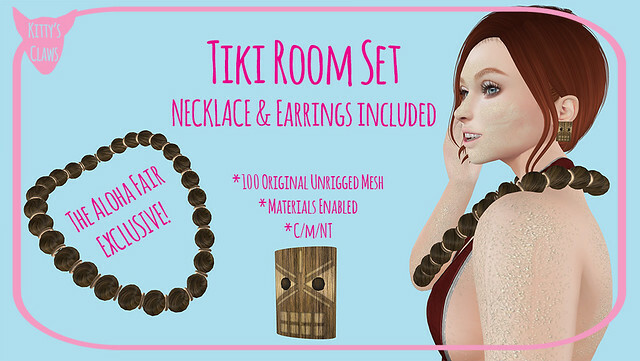 It comes with a beaded necklace and carved tiki idol earrings! It retails for L$125, 50% off retail pricing!!! Direct TAXI to my booth! The event runs from today, July 28th to August 11th! I had so much fun making these items, so I hope you enjoy them! In other news, I am in a new event in September and I thought I would give you guys an exclusive peek at the item! I love that Blender’s path extrude tool is working, unlike in Maya and I have been looping and looping all day long! Can’t wait to finish it and then sell it! That is all for now, but have a wonderful day and hope you stop by the Aloha Fair! Next: Next post: Kitty’s Claws @ Square1 Summer Sale!